Welcome to our Ischia blog, Good Morning Ischia! Here you can see the entry for Wednesday 18th December 2013. Although we're just seven days away from Christmas Day, it feels more like April or May outside as the island is bathed in brilliant sunshine. Everything you see is tinged with that little piece of sparkle provided by the sun and the natural colours of Ischia are being brought to life by the illuminating orb just above us. Perhaps partly due to the fact that we're so close to the winter solstice, the air is so clear that we're able to view great distances across the sea with islands like Ventotene, some 25 miles away, seemingly just a short swim away. Last night the sky was full of stars that you could almost reach out and grab them, while looking out to sea the moonlight was so strong that you could clearly make out the horizon even at midnight with the sun long gone. The weather forecasts remain for more of the same and temperatures today will be around a minimum of 11° Celcius (52° fahrenheit) and a maximum of 16°C (60°F), which is more or less how it was yesterday. Today's photo is of one of the fabulous nativity scenes now on display in Ischia Ponte. The "presepe" as they are know in Italy, are beautifully hand crafted models that depict not just the nativity but a wide range of characters and scenery from biblical times. We've all seen displays in churches, schools and Christmas shop windows but the presepe go a couple of steps further with their intricate attention to detail. Walking through the town yesterday you could see hoardings inviting you in to houses to view the presepe and once inside you enter into a different world. In one of the best displays, upon entering the room the curtains were swiftly drawn behind us, plunging the room into darkness and causing momentary consternation. However, after a few seconds the reason for closing the curtains became obvious as we were treated to a full-scale production including narration, telling the story of nativity with lights gradually illuminating the different scenes before finally revealing the whole scene with its carefully worked characters and animation. 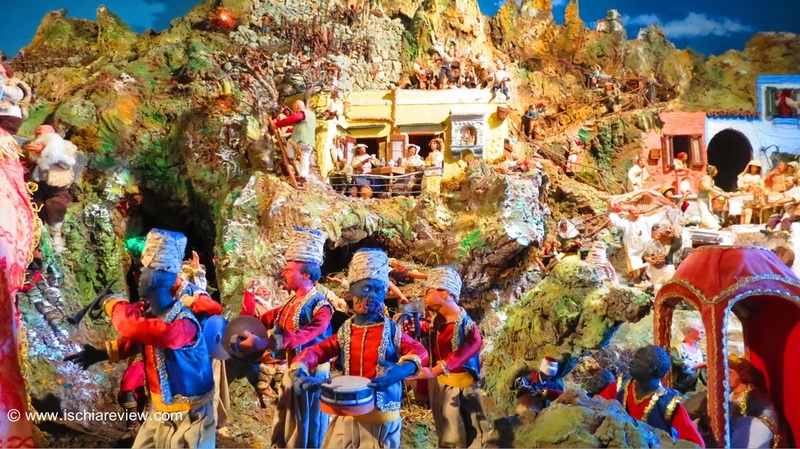 The presepe are a long-standing Christmas tradition in Ischia and share some of the characteristics of the world-famous displays that can be seen in Naples all year round but most notably during the festive season in Via San Gregorio Armeno. The skill and craftsmanship involved in creating the presepe follow hundreds of years worth of tradition in the art and are a great source of pride to their creators. All of the displays that I visited yesterday were free to enter, there were small baskets available if you wanted to leave a donation or a tip but it's very much a case of discretion without obligation. There's a new page on the site today for the presepe where you can see some additional photos here and I'll be adding more in the days to come. Ok that's all from me for today, it's far too nice outside to be stuck on a computer so I'm going to go out and see what else I can find and report back to you all tomorrow.